The tropicbirds are medium-sized seabirds with exceptionally long, narrow, central tail feathers that drag gracefully behind them in flight. They are predominantly white in color, with black markings on their face, back, and wings. They are typically found in tropical waters, where they fly with quick, strong wing-beats, or float on the water with their tails cocked. Although they sometimes nest in colonies when the conditions are right, they are not generally social, and are usually found alone at sea. 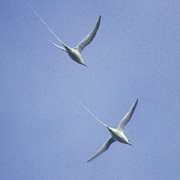 Tropicbirds feed on flying fish, squid, and other aquatic creatures, mainly by plunge-diving into the water. They are highly pelagic, coming to land largely to breed. They first breed at two to four years, are monogamous, and form long-term pair bonds. They nest in crevices or burrows, and both sexes help build the nest, incubate the single egg, and care for the chick for a number of months before it fledges. One bird collected off Westport (Grays Harbor County) in June 1941.